Sequoia National Park is a great place to visit if you plan to stay in the area before or after your river trip. The entrance to the Park is on Hwy 198. Advance reservations for accommodations in or near the Park are recommended. Call the Visitors Center at (559) 565-3341 for Visitor Information. 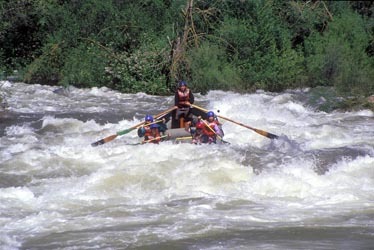 Sequoia Sightseeing Tours – Three Rivers, Ca (559) 561-4189 Offers private and group tours. Pick up at your hotel or resort. Call for rates and availability. If you enjoy hiking, it is definitely worth making a side trip in the springtime up to Sequoia National Park. The waterfalls and creeks are usually flowing at their peak in May and June. The park is also a great place to escape the valley heat. Jazzaffair, Three Rivers, Ca Every April Three Rivers celebrates its Jazz roots. Local bands and other jazz ensembles from around the country get down for three days. Redbud Festival Lions Arena, Three Rivers, Ca The Arts Alliance of Three Rivers presents the historic Redbud Festival every spring with a celebration of music, food, arts and crafts. Three Rivers Artist Studio Tour – Three Rivers, California is home to eighteen talented artists who open their studio doors every two years for the public to enjoy their creations and ask the artists about their work. Three Rivers Historical Society and Museum – For more information please call (559) 561-2707 or visit their website.